The Bristol & Bath area has been named as the UK’s most important centre for the fast-growing digital industry outside of London. A major new report – called Powering a Digital Economy 2015 – says the area is home to a globally-significant cluster of innovative businesses and a hotbed for future technologies. Businesses are backed by a network of support organisations such as Bristol & Bath Science Park, and leading business incubator SETsquared, based at Bristol’s Engine Shed. It also boasts a strong network of entrepreneurs while there are fewer barriers to growth than other areas named in the report. The report highlights the area’s strengths in digital and creative industries, which is says is due to its rich heritage in aerospace, hi-tech and natural history film-making. The report is the first national overview of the UK tech industry produced by Tech City UK, the Government-backed organisation focused on accelerating the UK’s digital economy. The Bristol and Bath area ranks second overall behind London in a list of the UK’s 23 significant digital clusters, with 61,653 people working in the sector – 5,500 more than in Manchester, which is often regarded as Britain’s most important regional city for digital. Data management and analysis, software development and edtech (educational technology – using technology to improve learning) are highlighted as the area’s key sectors with its core capabilities including network infrastructure and protocols, systems design and integration, and UI and UX Design. Between 2010 and 2013 the number of digital companies setting up in the area increased by 65%. The majority of cluster members (79%) report that there is a strong network of entrepreneurs in the region. A particular strength of the cluster is its ability to help companies find advice on business and marketing skills, with 48% of companies drawing on this support in the past year. This ranges from accelerators and seed funding through to office space, networking and VC pitch days. Some 79% of firms in the cluster said its access to social networks was a particular benefit, along with access to talent (mentioned by 50%), access to property (40%), access to private finance (35%) and to public finance (31%). Digital firms in the area cited fewer major barriers than other UK regions. While competition for property and talent was described as “fierce”, there is a wide range of support services that are tackling this. The report said the city’s 70-hectare Temple Quay Enterprise Zone, which stretches from the Engine Shed to Paintworks on Bath Road, will be critical to providing accommodation for the digital sector. Among the businesses highlighted is Bristol and Bath-based Neighbourly, an innovative social network aimed at connecting community projects with companies. The firm is part of the SETsquared network, which is backed by the universities of Bristol, Bath, Exeter, Southampton and Surrey. SETsquared director Nick Sturge said: “The tech and digital sector in Bristol and Bath has an excellent reputation for being home to the most skilled talent pool in the UK, strongly supported by the region’s four leading universities. “The delivery of thriving incubator spaces such as the Engine Shed is also supported by the universities, providing tech and digital businesses with the perfect environment within which to grow and work collaboratively. An estimated 500m-plus users view digital content produced in Bristol and Bath every month. Alongside global leaders like Aardman Animations, IMBD (owned by Amazon) and Hewlett Packard, the region is also home to Yogscast, which is behind the world’s largest gaming YouTube channel, and award-winning Opposable Games at Bristol Games Hub, the largest independent co-working hub for games developers globally. Major inward investment successes in the tech world include the world’s largest independent mobile solutions company Somo, leading online takeaway service Just Eat, and Chinese telecoms giant Huawei. The Bristol and Bath area was recognised last year in the highly-respected McKinsey & Co/Centre for Cities report as having the only fast-growing, globally-significant technology cluster in the UK. The strength of the digital sector in the area has been integral to the growth of a thriving gaming industry, which is behind cutting-edge innovations such as the development of virtual reality technology for gaming and non-gaming applications such as aerospace and advanced engineering. Later this month, leading lights from the entertainment and gaming world will gather in Bristol for the inaugural SouthWest VR Conference, which will shine a spotlight on how virtual reality is transforming the way users interact with film, games, TV and animation. The report was welcomed by the Prime Minster and Chancellor of the Exchequer, who promised to back the growth of digital clusters across the country. 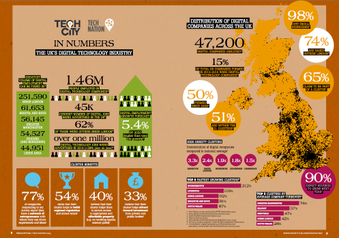 The report says: “Digital technology companies are pivotal to the UK economy. The diverse digital industries that make up our nationwide technological DNA have grown over the past five years despite a challenging economic climate.